An resin 3D Printer working with LCD and UV LED&apos;s.
This project was created on 07/21/2016 and last updated 3 years ago. Some months ago I released SLAcer.js an Open source web based slicer for SLA printing and now I would like to offer a simple, complete and reliable solution to build an SLA printer at home. Basically there are two very common techniques for SLA printing : DLP and LASER. Personally I find it unfortunate to monopolize a beamer for a printer, so no DLP here. Laser? why not but it is complicated to implement, (and dangerous), so no laser. What remains? A more recent technique is to use a nacked LCD panel as slide and UV LEDs to cure the resin. Hmm not bad! No overpriced equipment, possibility to recycle old screens, simple to implement... Ok! we&apos;ll go with that. Simple electronics based on an Arduino board with Grbl firmware. Fritzing project. Need help to do a better board and shematics... I am limited with electronics. Thank you for your indulgance. New FlexyVat [credits to @James Kao] much better than my press-fit version. SLAcer.js can now export slices as SVG. I am limited with electronics. Need help to do a better controller board and shematics. Thank you for your indulgance. I am new in this domain and i have a curiosity, how is sticks the part on the table? Sebastian, you know if this works with screen ipad 3? I have here led uv 400nm 100w. I do not know ... We have to try. How exactly do I need to connect UV LED driver ? 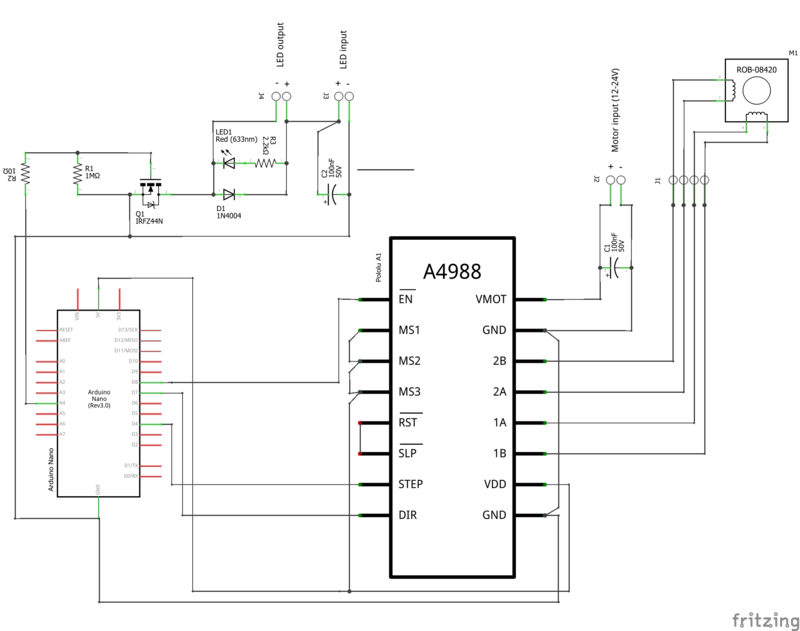 Driver out to LED input or driver in to LED output ? From the LED driver output to "LED input" and the LED wires to "LED output". Just get some parts for my printer. retina display ipad 3, led 100w 400nm, LED driver. I am following your project and would like your support and possible! Great job, nice to read and to get informations for my project! Which Resin do you use for this? Only one thing in the last project you use a fresnel lens but where you buy it? and under the lcd that you use you remove only the backlight or all the films? I removed all (amovible) filters on the LCD. The fresnel lens can be found on ebay. Try to find fresnel with a focal the closest to the distance between the LCD and the LED. There is one aluminyum filtre back of LCD. We must remove but it is well stick on lcd !! I&apos;m not sure I understand. Why complicate things by adding a mobile element? In addition, the exposure time will be longer. I want to use an ipad 3 display retina for my printer..
Is possible to know where i can buy the components please? I need to remove only the backlight panel or also the films under the lcd after remove the backlight? Sorry I do not have all information at this time, you have to test by yourself. I have made only one prototype. The next (with LED array and 5.6"LCD) is coming soon with the rest of the instructions and more details. Be patient (or do it yourself), I do this in my spare time. The OLO is a gadget at ~600$ (99$ + ~500$ for the phone) powered by AA batteries and working with visible light resin... the curing time is long and your phone must be in airplane mode with wifi and alerts turned off ! Definitely not for professionals... and BTW not Open-Source. You&apos;re being a bit dramatic! A used smartphone is only $100-$200 for a last gen high end Android. You can get a perfectly usable mid tier last gen for under $100. I am amazed at their dedication , was seeing a material using retina iPad screen using UV 400nm to 420nm with 5% absorviçao it would be a little more per layer cure time . Hello why not use ipad screen? That because I have several old LCD I want to use [https://goo.gl/photos/CBWuzQbK6VCCLjp67]. But you can use whatever you want. This project is more a concept than a finished product, a bit like the RepRap project, anyone can make improvements. Do you have any pictures of cleaned (but not otherwise post processed) parts? I&apos;m curious what the results look like! Sorry I do not have many pictures of finished parts, some one in the gallery : https://hackaday.io/project/12791/gallery#019e9a1922dcc0d8d0d3e338b3948e11 (but more will come soon). Three reasons for the slicer : First to learn; Second for the fun; Third I contribute to the SmoothieBoard project (http://smoothieware.org/) an Open Source Hardware CNC controller board with an embedded web server, so no need to rpi or anything else, just upload SLAcer.js (js + html) on the server and you have a standalone machine that is accessible through a web interface. P.s: I apologize for my bad English. For the resolution... I did the math and got... 5.6*25.4/sqrt(1280*1280+800*800) = .09423381153256540211 the same answer as you. If you strip the RGB filters, you should be able to get 3840x800 resolution by the way. Awkward to have non-symmetrical resolution., but better than .1x.1..
For now just tested at 0.1mm, but the Z axis resolution is 0.00125 mm/step with 1/16 microstepping. To be honest, I have not tested the proportion of uv captured by the lens. But I&apos;ll will test soon without the condenser to see if it makes a difference. To be sure: I don&apos;t THINK that it absorbs 80% of the UV, but it COULD be. We humans are more or less used to "something is opaque" or "something is transparent" and that we have a good idea about which is which. But we have absolutely no intuition for wavelengths "outside our sensory bandwidth". For example I know that glass is opaque for 10 micrometer infrared. Haha! ~10 FPS nicely translates to 1 microstep per frame... The amount of data that your slicer needs to produce however is enormous! (If my estimate is good, about 9 FPS results in the same exposure time as now). See 4:30 for an example of a counter-intuitive IR transparency. (the title and the woman in the preview frame are clickbait. No naughty parts are seen in the video :-) ). @r.e.wolff Just tested without the condenser lens and the result is not great... apparently the lens does not filter UV. Slight disadvantage of using a 1:1 setup with an LCD screen is that the resolution of an LCD screen is more-or-less fixed at around .25mm per pixel. With the current geometry it will be difficult to get significantly higher resolution. On the other hand, a projection might also be possible. Keep up the good work! Maybe I misunderstand something .. Creating an Auto-Off for an Alunar Anet A6. I got printers, now I wanna hack them into 3D printers! You are about to report the project "uTopiaPrinter (SLA)", please tell us the reason.